Up for review today is the Edison Mina in both the standard and extended versions. This is a truly gorgeous design. My mother was with me when I opened the box and we both oohed and ahhed at the sight of these pens, especially the extended version in the black rose acrylic. This is definitely one of those designs that will turn heads especially if you choose the right material for the job. The regular Mina was sent to me in black acrylic. The black material shows off the design of the pen, but it doesn’t pop. The extended Mina came to me in the Black Rose acrylic. This material is just about perfect. The subdued swirl sets off the subtle curve of these pens, the the material does not overpower the design. The design of this pen is quite wonderful if subtle. There is a subtle flare at either end that makes the pen un-postable. At the same time, that flare makes for a very well-balances comfortable feel in hand. Despite the extra material at the back, this pen is not back heavy. Both the extended and regular Mina feel comfortable to me, but the extended is the more comfortable of the two. I do have largish hands for a woman, so that probably explains it. Although this pen is being marketed as a ladies pen for someone who likes slimmer sections, the overall feel of the pen is similar to that of other Brian Gray pens. It feels substantial in the hand. The slimness of the pen is only evident in the section design, which feels significantly less girth-y than my Edison Glenmont. As mentioned above, you cannot post the cap. This model is also clipless. The flare design does make this pen somewhat more prone to rolling. You’ll want to be careful when setting the pen down. Brian does offer a pen rest (purchased separately) to help guard against accidents. The nib for this model is different from the others Brian offers. They are a smaller size. Whereas his other pens are #6 sized nibs, the Mina pens have #5 sized nibs. This is part of what allows Brian to slim down the section. The nibs are available in 18k gold or steel. The 18k nibs come in standard sizes of Fine, Medium, and Broad. The Steel nibs come in the same standard sizes as well as stub italic sizes of 1.1mm, 1.5mm, 1.9mm and 2.3mm. As always, Brian will make custom nibs for an additional fee. One of my pens came with an 18k Fine nib and the other came with a 1.5mm steel nib. The 18k Fine is a smooth wet writing nib with just enough tooth to keep the pen under control. The 1.5mm steel nib is quite smooth with the same amount of tooth. However, it is not quite as wet writing as the 18k fine, but I would not characterize it as dry either; it has average flow. I’ll just mention again with Brian can and will do custom grinds for a fee and will generally adjust smoothness and flow free of charge. The Mina comes standard with a cartridge/converter filling system. It takes the standard international sized C/C. You can also use your Mina as an Eyedropper filler. These are not my pens, so I did not do this, but the conversions appear to be quite simple. All you need is a little silicone grease and you should be in business. The barrels seem quite cavernous. I’d guess they hold in excess of 2ml of ink. You can also get this model with a Bulb Filler for an additional fee. My Edison Glenmont is a bulb-filler. I love that system. It is simple yet efficient. I highly recommend this system. The Mina is slightly less expensive than Brian’s other models. It is priced at $200 for a steel nib, and $300 for an 18k nib. The bulb filling system is an additional $100. Nib customization ranges from $20-$65 depending on what you want done. I think this is an excellent value for the quality of these pens and the time and care taken to make them. *Note: Brian only charges $65 for custom flex grinds! All in all, I think this is a fantastic addition to Brian’s line. The pen is beautiful, and comfortable in the hand. It offers a slimmer section for those with smaller hands, but the section is not so slim as to be uncomfortable for those with larger hands (such as myself). These pens were sent to me for review by Brian at the Edison Pen Co. They were not given to me; they were only a loan. I have since returned them. I was offered a discount if I chose to keep one of them. I declined the offer. I am not otherwise affiliated with Edison Pen Co. or Brian Gray. It’s posts like this that make me extra happy you are back to posting Dizzy! Nice review and gorgeous pens. Thanks Mike. That’s very nice of you. I love the Mina. Have one in ebonite. Have one more on the way. And that’s it. Although your Glenmont always gives me pause. Julie, thank you for the kind words. I am not sure which one I’ll get. I’ve had my eye on the Morgan since it came out. Whichever it is it will be some time coming. I’m in the midst of a career change. Money doesn’t flow like it used to. That’s a major deal! Sending good thoughts about the career change. As a “starving artist” I can attest that money flows in ways we don’t always expect. 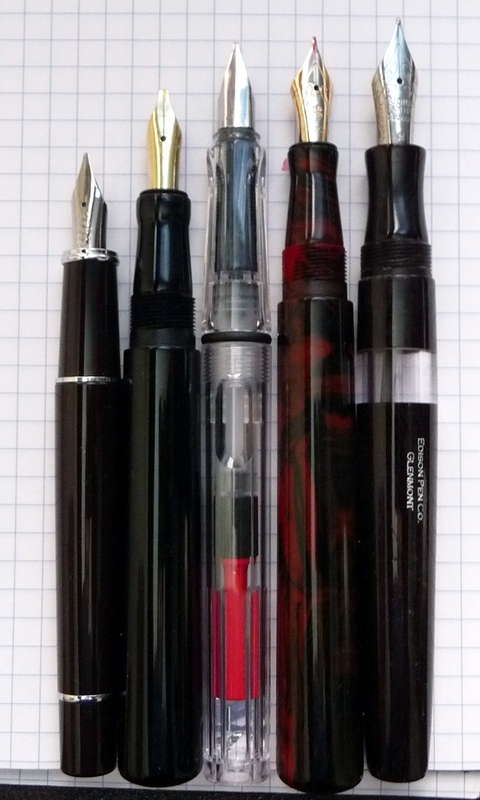 It makes pen acquisition more… meaningful for me. 🙂 The Morgan is a very handsome model. Some day I’ll have to handle some of Brian’s other pens. Hang in there!